Sri Lanka’s Central Bank yesterday left its key policy rates unchanged as the short-term rates eased and the pressures on medium term prices in the economy appeared less of a concern. But the credit to the private sector remained stubbornly at elevated levels. The 5–member Monetary Board, which met on Monday for the 6th time for the year had hence decided that the existing 8.75 percent rate, at which liquidity is injected to the banking system and the 7.25 percent rate at which the excess liquidity is absorbed are appropriate at their current levels, as its earlier money tightening measures are gaining traction, albeit slowly. In Sri Lanka, there is often a 12 to 18-month lag between the monetary policy decisions and its impact on the real economy. Sri Lanka’s key policy rates were raised by 125 basis points in three instances from February 2016 to March 2017 to cool down the economic maelstrom caused by rapid money printing to artificially keep the rates lower and the expansion in the fiscal policy. But Sri Lanka’s monetary conditions have been improving from the beginning of this year after the Monetary Board began to target the inflation from the previous monetary targeting and the money printing was stopped as fiscal conditions improved. Also, market liquidity significantly improved while the assets held by the Central Bank – or the printed money stock – fell sharply from over Rs.300 billion at the beginning of the year to Rs.50 billion by September 25. When the Central Bank buys treasury bills and bonds through printed money to the budget deficit, the stock of money in the economy goes up and the banks could lend such money at lower rates over and above the deposits they raise—an economic malaise, which creates inflation and erodes value of money earned by the people. But the fiscal side is now improving with less pressure for finances from the government and the new Inland Revenue Act will also augur well for the interest rates and ease the pressure on the Central Bank. The Central Bank is now little worried over the August inflation which reached a 6.0 percent because the medium expectation is much benign. “Nevertheless, projections indicate that inflation will revert to the envisaged mid-single digit levels by end 2017 and stabilize thereafter, underpinned by tight monetary conditions that have been in place from the beginning of 2016”, the monetary policy statement released yesterday stated. However, the money supply caused by broad money or M2b still remains at elevated levels at 21.3 percent by the end of August due to the, “the expansion in the net foreign assets (NFA) of the banking sector, as a result of the buildup of NFA of the Central Bank and the reduction in foreign liabilities of commercial banks”. This was possible due to the improvement in the external sector where the Central Bank managed to directly buy dollars from the market and part of it was used to build up foreign reserves. The Central Bank has so far bought US $ 1.1 billion dollars on a net basis and built reserves up to US $ 7.3 billion by September 21, but down from US $ 7.7 billion by the end of August. “With increased flexibility in the determination of the exchange rate, the pressure in the domestic foreign exchange market has eased considerably, resulting in a cumulative depreciation of the Sri Lankan Rupee against the US dollar by 2.0 percent up to 22 September 2017, in comparison to the depreciation of 3.8 percent observed in 2016”, the monetary policy statement added. Meanwhile, the growth in private sector credit in July and August remains a conundrum as during the months it registered a growth of 18.0 percent each. In absolute terms, such credit grew by Rs.51 billion and Rs.53 billion respectively, but the Central Bank appeared to be more or less comfortable with the numbers. “The growth of credit extended to the private sector by commercial banks has shown a gradual deceleration since July 2016, responding to the prevailing high nominal and real interest rates in the domestic market. Meanwhile, deposit and lending rates appear to have stabilized, partly in response to the recent decline in yields on government securities”, the statement added. However, during the first eight months, the banking sector has given Rs. 405 billion in private credit, compared to Rs. 456 billion loaned during the corresponding period last year. Central Bank expects the private credit to ease to around 15 to 16 percent by the end of the year but the in absolute term this still translates to a whopping amount given the higher base. Meanwhile, the financial conditions in the government and the government corporations showed some improvement during the recent months. The net credit to the government has increased by only Rs.3.0 billion while the credit to the public corporations has fallen by as much as Rs.48 billion during the two months to end-August. The Central Bank yesterday said it does not want to see a dramatic drop in workers’ remittances, the largest foreign income source to the dollar-hungry Sri Lanka, but pointed out that a gradual decline could even become a blessing in disguise given the country’s tight labour market. The cumulative workers’ remittances in the first seven months of this year fell 5.7 percent year-on-year (YoY) to US $ 3.94 billion despite a 3.4 percent YoY increase in July to US $ 592.1 million. This apparently is the second time where Sri Lanka has seen drop in workers’ remittances. The first drop was recorded two years ago, when workers’ remittances in 2015 fell to 6.9 billion against Rs.7 billion in 2014. External factors such as the Arab Spring, dip in oil prices and the most recent ostracizing of Qatar by its Arab neighbours have had major implications on workers’ remittance flows to countries like Sri Lanka and Bangladesh, where earnings from overseas workers play major role in their economies. “We are having a very tight labour market. Some of the growing sectors are having difficulties in getting people. So the ideal scenario would be for us to see investment, including FDI coming into the tradable good sector and absorbing more labour. 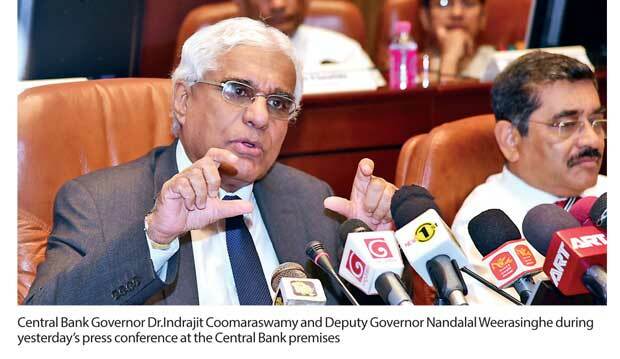 So, a shift of labour from temporary migration to a growing exports sector could have a positive development because it will also address some of the serious social problems associated with temporary migration,” Central Bank Governor Dr. Indrjit Coomaraswamy told reporters in Colombo, yesterday. But the Governor was cautious to add that he doesn’t want a sharp decline in workers’ remittances as it could prove disruptive. Workers’ remittances have been financing 70 to 80 percent of Sri Lanka trade deficit. “We would not want to see a sharp decline in remittances because that would be disruptive. But if we see export expansion taking place in the medium term then some easing of remittances may actually be a good thing because there would be more labour available in the country for more dynamic growth sectors in the economy,” he said. The government is also seen making efforts to change the composition of temporary migration and send more trained and skilled labour and cut down on housemaids.